Another successful week...and I call any week I am able to get some EPP in, a successful week! Since we split our time each week between our camper and our home, I set up two kits; one for each place. This seemed like a good idea, because then I don't have to carry everything back and forth. I am still working out the logistics, but so far it is working pretty well. 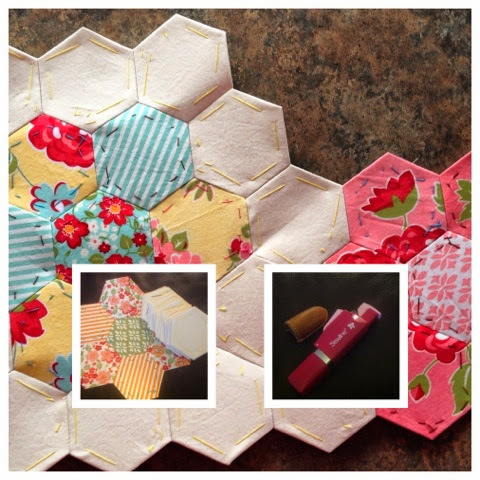 While at home this week, I basted 30 background hexagons. Traveling between places I completed one flower. While camping, I was able to stitch two sections together. I have finally settled on my favorite thimble - the Clover Natural Leather thimble. I have one in each kit now and and could not imagine stitching without it! Thank you to everyone who made suggestions! I swear I must own 20 different thimbles! My latest favorite gadget is the Sewline Needle Threader. It works great with the smaller size needles and finer threads. I use a size 10 needle and 50 weight thread. It works every single time. I love it and just ordered a second one so I don't have to carry it back and forth. I have 25 flowers left to complete and lots of stitching to get it all put together! I will hit one year working on this project next week. This is my very first project and I am so thankful for everyone who has helped me along the way. I have learned so much from everyone! I am linking up with Jessica at Life Under Quilts. Check it out and you may just want to join us! Also, check out Jessica's book -- Quilting On The Go - it is awesome - full of tips and projects and great for everyone from beginner to experienced! This quilt will be so beautiful. I might try that thimble as my finger end is not pretty right now! Your quilt is going to be so pretty! As another thimble collector, I'm curious to know why this one worked for you? I've seen it but haven't tried one yet. Thanks! Hi Tracey! I really like this thimble for a few reasons. It doesn't have any side seams so my thread doesn't get caught and I happen to be a 'side pusher' rather than a top pusher. It forms to your finger the more you use it. It is a little expensive, but well worth it. I hope you give it a try!! I really like your fabrics - great progress!